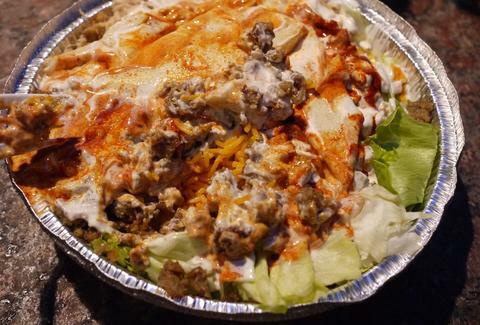 Get ready to ask for soooo much extra white sauce, L.A.
As part of a global expansion, New York City's most famous purveyor of gyros and chicken platters drenched in signature white sauce, The Halal Guys, is planning to open dozens of franchise stores across Southern California, according to a report by Foodbeast. Let there be meat on the streets. In stores, not carts. But whatever. As many as five Halal Guys locations will open in Los Angeles and Orange County by the end of the year alone and a total of 50 stores are planned for across Southern California. Known mostly for its cart on NYC's 53rd Street that draws hourlong waits for lamb over rice, Southern California can expect brick and mortar locations with outdoor patio space, according to Fast Casual. The first two physical stores opened in Manhattan's East Village and the Upper West Side. In addition to SoCal, franchise and corporate Halal Guys locations are planned to pop up in Houston, Chicago, Philadelphia, the Philippines, and Malaysia, according to the report. Tony Merevick is Cities News Editor at Thrillist and is giving you some side eye for your immature "white sauce" jokes. Follow him on Twitter @tonymerevick.